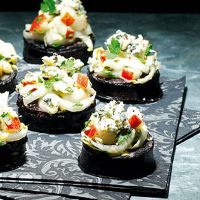 Black pudding - hot or cold - makes the perfect foil for a sweet and salty salad. Put the chicory in a bowl with the pear and crumble in the cheese. Add the parsley and season with black pepper. Mix briefly. Warm the oil in a frying pan over a high heat and fry the black pudding slices for 2-3 minutes on each side. Drain on kitchen paper. Spoon 1 tbsp salad onto each. Season with pepper. This recipe was first published in Sat Dec 01 00:00:00 GMT 2007.